Aera is providing support to the European Space Agency (ESA) at the European Astronaut Centre (Cologne DE) Training Division since 2004, managing & integrating the crew training of the European Element for all International Space Station Astronaut (NASA, ROSCOSMOS, JAXA, CSA and ESA). Aera has managed the training for Expedition 17/21/22/25/26/31/32/41/42/49/50/59/60. Aera has been also supporting Flight Controller Training in European Simulation (involving Columbus Control Center and User Support Operation Centres) and in Joint Multisegment Simulation Training (NASA, ESA, JAXA). In cooperation with 9th Regiment of the Italian Army (9° Reggimento d’Assalto “Col Moschin”). Aera has also managed and supervised the Human Behaviour and Performance (HBP) Training Program driving the development of the established ESA HBP training course. With its competencies in Space Operation and Astronaut Operation, Aera is involved in the review panels of Phase A/B/C/D of numerous European Payloads developed by the European Space Agency. Aera has been procuring space hardware components in support of Astronaut Training Model development, the expertise in training aera allows Aera to find the right compromise between needed fidelity of the model and cost effort for the development. Aera has been involved in space operation since 2002 providing mission support and procedure development since the first Italian Soyuz Mission “Marco Polo”. 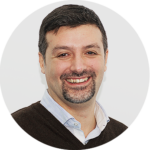 Aera Space division is managed by Luca Anniciello. Since September 2001 Luca Anniciello has been working at the European Astronaut Centre in Cologne mainly in the P/L Training Unit having the responsibility of managing the Fluid Science Lab Training Catalogue and Training Models. In addition he has been certified as ISS Instructor and he hold a FOTA certificate. His excellent teaching skills have allowed him to become a certified ITC instructor. Since December 2003 he has been assigned also to the Human Behaviour and Performance (HBP) Training Program driving the development of the established ESA HBP training course. From September 2006 he has been acting as P/L Training Unit Head managing the complete P/L Training Development and following the Payloads’ Training Model Refurbishment. In addition he has been representing ESA in the Multilateral Payload Training Panel, increasing his expertise in the field of International Astronaut Training Management by working to develop Multilateral Increment Training Plan and Multilateral Advanced Increment Training Plan. His expertise on all ESA Payloads has been used in several P/L Integrated Simulation to monitor performance of the Flight Controller Team. Since April 2007 he has been Increment Training Lead for Expedition 17/21/22/25/26/31/32/41/42/49/50/59/60 and has managed the training plan for the following European Astronauts: Samantha Cristoforetti, Thomas Pesquet, Luca Parmitano.